Grapple with New York’s finest. Alex is a wrestler, and so his move set matches what you’d expect for that archetype – but despite that he’s quite different to Zangief and R. Mika. He’s focused on hard-hitting combinations. He has several moves that allow him to press in on opponents who are careless quickly, and specials that chain into each other to deadly effect. Alex is the type of character who needs to be in close, so it’s crucial to use the slash, Air Stampede, Head Crusher to close in on opponents. His V-Skill and V-Trigger are both geared towards maximizing his potential for high-damage combos, so be prepared to experiment with him. Alex stretches his muscles and pumps his arm. Once this animation is completed, the next attack he attempts will hit as if it’s a counter-hit – which in turn will leave the opponent open to deadly consequences. If an attack is whiffed or blocked, the V-Skill’s effect is wasted, so be careful. Alex powers up and gets ready to crush the opponent. In the process, he gains access to a new move, the clothesline. Press both HP and HK simultaneously to begin this move. Pressing and holding will make Alex wind up. If the move charges all the way, it’ll break block. This move also has armour, meaning it can absorb an attack. Try pressing and holding to wind up when an opponent attacks you – their attack will bounce off, then you can release and unleash an attack of your own. Alex performs a deadly-looking forwards chop. The punch button used will determine the distance it reaches, with heavy punch reaching the furthest. The heavy punch version can be used to link directly into a Power Bomb if it connects. The EX version is fastest of all, and is difficult to counter. A sudden dash across the screen that ends in a hefty elbow charge. The kick button used determines the distance the dash travels and also determines if the move simply knocks back or knocks down when it connects. Heavier versions can be used as a combo extender or ender. There’s an EX version too, and has armour to absorb a single attack mid-dash. Alex sends himself soaring skywards to meet the opponent with an outstretched knee. If it catches, it’ll drag your enemy back to the floor with you rather than send them flying. The button used determines how far forwards Alex flies as well as upwards – hard kick will have Alex land almost one complete screen length if the attack misses. The EX version performs like the Medium Kick version, but does more damage and starts up more quickly. This standard-issue grapple move sees Alex grap the opponent and slam them into the ground in a fashion that’d make any wrestling superstar proud. The punch strength used determines how quickly the move starts and damage – heavier moves do more damage, but start up more slowly. The EX version is the best of all, as you might think. Remember that several moves in Alex’s arsenal, such as the Flash Chop and the Clothesline from his V-Trigger, link directly into this move. Alex hops up into the air in a tiny jump and, if you space it correctly, slams down onto the opponent’s head, knocking them down. This could be a great punish against projectile spammers, or just a way to close in on your opponent. The kick button used determines how far across the screen Alex jumps, from close-range to almost full-screen. The EX version performs like the medium, but with more damage and faster execution. This move is very similar to Air Stampede – it hops up quickly and suddenly, with the button used determining how far Alex jumps across the screen. Rather than aiming to land on the opponent to damage them, however, this move sees Alex reach out in a grapple as he lands. This grapple floors the opponent if it connects. There’s an EX version too. 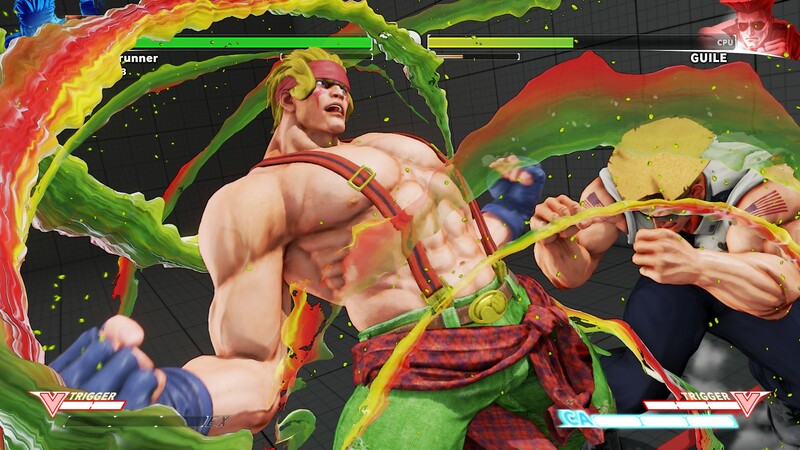 As before, this is an ideal projectile punish move, but don’t confuse it – it’s not designed as an anti-air, despite Alex’s grab ending just before he hits the ground. Alex lets rip three slashes that chain into an automatic grapple that takes the opponent high in the air and then slams them down. Despite the fact that this turns into a grapple, it technically isn’t one – the chops at the start of this move need to land clean in order to trigger the full animation and damage. It can be easily blocked. These moves are ‘normal moves’, but are executed when pressing certain button combinations or sequences, and often have specific uses and properties. Try them in training mode to see what they’re useful for!